A bronze plaque attached to a massive granite boulder commemorates Mary Sheffield Dunn (1759-1862), a nurse and heroine of the Revolutionary War. The marker stands near the grave of Mary Sheffield Dunn. Two American flags were draped over the section of the enormous stone to which the plaque had been welded. At 2:30 Boy Scout Charles Ross sounded assembly on the bugle to begin the ceremony. An invocation was given by Mr. Caligan of the Presbyterian Church followed by a salute to the flag led by the D.A.R. The chapter regent expressed her thanks to those who made the occasion a success. The plaque was then unveiled by two little girls, Sheffield Liles and Sarah Dabney both descendants of Mary Sheffield Dunn. At the outbreak of the Revolutionary War Mrs. Dunn was a well-respected nurse and midwife who along with her husband Isaac joined the Patriots. She could often be found at her husband’s side while he fought in Colonel Thomas Wade’s regiment. Often harassed by Loyalists, one attack by a sabre wielding Tory left a lifelong scar. Throughout her life in a time when physicians were rare she was known as a woman of medicine. The marker is located at the Bennett Cemetery, 437 State Rd. 1812, McRae Ave, several miles outside of Wadesboro off U.S. Highway 74. 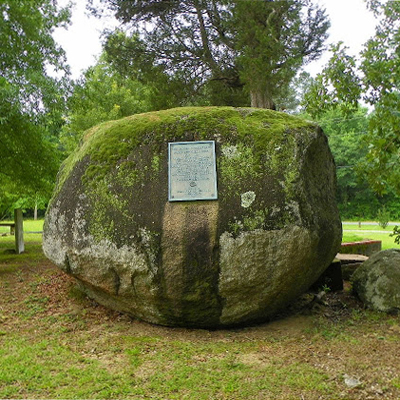 The boulder stands right behind the grave of Mary Sheffield Dunn. The memorial is surrounded by tombstones and mature trees.